We have our first look at Will Smith as Genie in Aladdin. We recently got a look at the first teaser trailer for Disney's upcoming remake of their animated classic. Unfortunately, it really was just a teaser and didn't reveal much. Genie included. However, a new batch of photos have made their way online further showcasing the new take on the tale and Smith's Genie has been revealed, which is something that the internet is surely going to feel a certain way about. Robin Williams initially portrayed Genie in the 1992 Disney animated version. There, he was portrayed as a big, blue, translucent and huge being. Here, Will Smith is in the flesh and looking, needless to say, different. He's not blue, his clothes are radically different and, to put it simply, it's a far cry from what we're used to seeing. The final version of Will Smith's Genie in his blue floating lamp form isn't quite finished, and he will have that iconic blue hue when the finished movie hits theaters. Disney was in a box here, as what worked in animation wasn't going to work in live-action, especially since they have cast such a different actor to portray the character. It feels very much like, if Robin Williams had still been with us, they would have brought him back to play the role somehow. Similar to what they're doing with The Lion King by having James Earl Jones come back to voice Mufasa, while surrounding him with an all new cast otherwise. In this case, that wasn't possible. Smith had this to say about taking on the role, calling it a mix of his roles on The Fresh Prince of Bel Air and Hitch. "Whenever you're doing things that are iconic, it's always terrifying. The question is always: Where was there meat left on the bone? Robin didn't leave a lot of meat on the bone with the character... I started to feel confident that I could deliver something that was an homage to Robin Williams but was musically different Just the flavor of the character would be different enough and unique enough that it would be in a different lane, versus trying to compete... I think it'll stand out as unique even in the Disney world. There hasn't been a lot of that hip-hop flavor in Disney history." Is the world ready for a hip-hop Genie? This is one of those instances where seeing something as a still image might not have been the best way to go about it. Will Smith is as charismatic as they come and, while very different than Robin Williams, there would seem to be a way to make this work. But maybe we all need to see it actually in some footage before that's as easy to see. 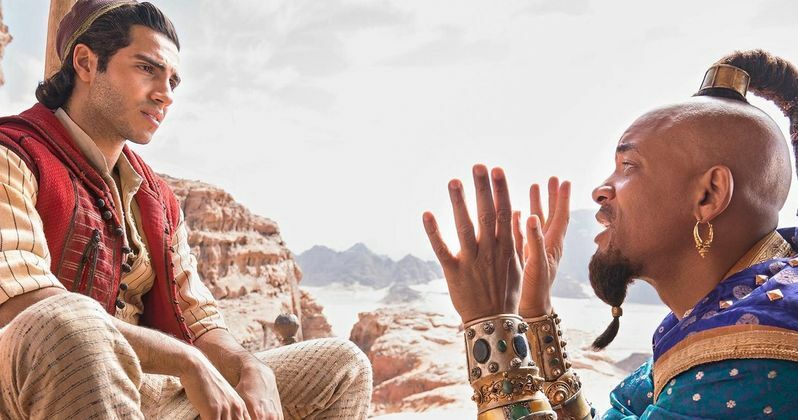 Guy Ritchie is in the director's chair and, in the titular role is Mena Massoud, who can be seen alongside Genie in these new photos. Power Rangers star Naomie Scott is in the role of Jasmine with Marwan Kenzari as the big bad Jafar. Hopefully, Disney won't make us too long to see another trailer and reveal some actual footage of Will Smith's Genie. Aladdin is set to hit theaters on May 22, 2019. Be sure to check out the new images from Entertainment Weekly below.